Coltman Street runs at right angles from Hull’s Hessle Road up to the other running west from the city centre, Anlaby Road. Coltman Street, c.1905. Behind the railings and red brickwork lived many affluent middle class merchants and families made wealthy by the fishing industry in Hull. Image courtesy Carnegie Heritage Centre, Hull. 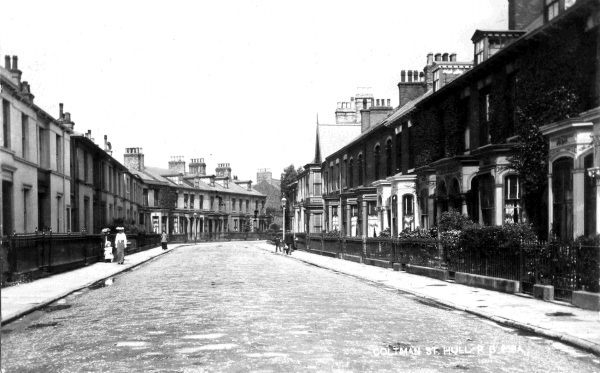 In days past Hessle Road thrived, fuelled by shipping and fishing in the UK’s third port but the Cod Wars of the 1960s and 70s ran the area to ground, town planning eventually taking families living in its Victorian streets to new estates built on the fringes of the city. In the years that followed it fell to a quiet while young boy Simon Kelsey walked along the ladder of streets around it looking up at their houses seeing not the crumbling bricks and flaking paintwork but their past, their years of glory. To Simon Coltman Street’s iron railings hid behind them a wealth of history which he fell in love with, particularly the building at number 114. Big and square it was an oddity on the street; it had red brickwork and a wall into a garden with a big round arch but it had been divided into flats and then abandoned and time was running out. He couldn’t let it happen, made a decision and using his life savings bought it intending to save it. 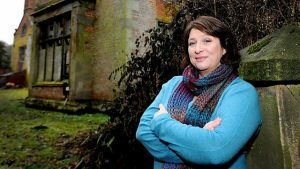 Caroline Quentin, presenter of BBC TV’s Restoration Home follows Simon Kelsey’s progress every step of the way. BBC’s Restoration Home hosted by Caroline Quentin visited number 114 at the beginning of works. Through her we learn that Kelsey’s decision came with a condition; he had to complete the renovations in a year or the council would take back the Grade II listed building. We held our breath watching him falter as he admitted his hopes and dreams could come to nought. Following his ups and downs the programme takes watchers through every exciting and painful stage of the development, learning about the history of original owner Christopher Pickering and the area along the way. 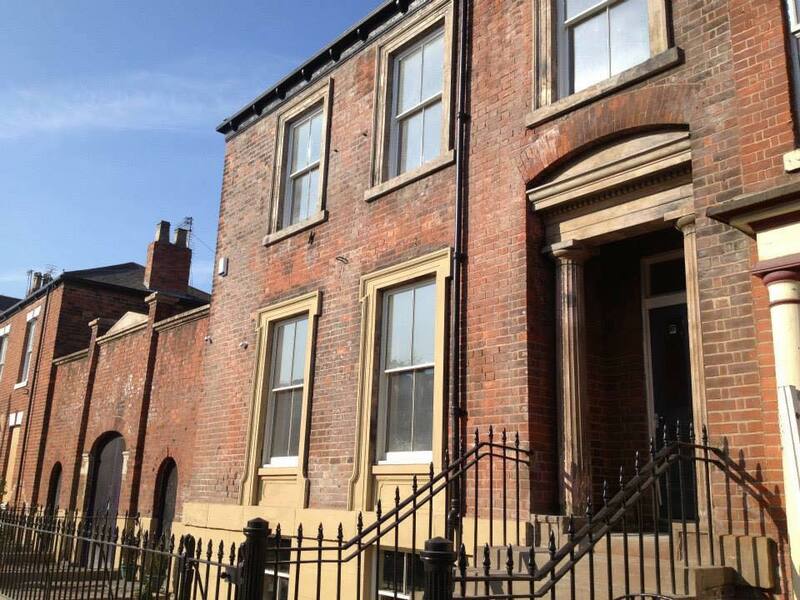 At Hull History Centre historians uncovered Pickering’s past and with it the importance of number 114 Coltman Street to the overall story of Hull. A keen philanthropist – someone who gave to charity – his work is seen in the famous Pickering Park, to name but one. By the end of the build when Restoration Home was screened, it sported a blue plaque to him on its freshly repointed walls. Coltman Street has bags of history. It’s position means it will never be disconnected from the fishing industry nor Hessle or Anlaby Roads. Historian Dr. Alec Gill’s work recording its heritage in film and photographs and the books he’s authored span the area as well. 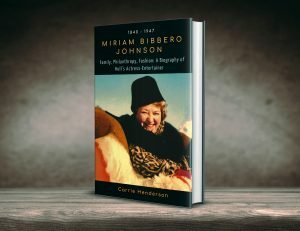 Miriam Bibbero Johnson’s Biography touches on the history of Coltman Street – she and her family lived there also. Our biography about Mira Mountain owner of the House of Mirelle does also – she lived there along with her family who added to the character of what locals call ‘Road. Miriam Bibbero Johnson: Family, Philanthropy, Fashion. A Biography of Hull’s Actress-Entertainer. She was also a great philanthropist ‘raising thousands’ in her lifetime for many charities. From the Mother Humber Fund to the NSPCC, RSPCA and Imperial Cancer Research Fund her work was vital. Her family lived very near to number 114 at 75 Coltman Street from the turn of the 19th to 20th centuries, her grandparents close by on Hessle Road. By the early 1930s when they lived at number 113 she was a famous actress, known all across Great Britain from BBC TV and Radio and the local and national stage. Like Pickering she remained loyal to East Yorkshire making sure her charitable work and success benefited those in need in Hull. Pickering and Mira Johnson were part of a culture of philanthropy which characterised its caring city. You can get hold of our story of Mira Johnson on Amazon. Inspired by Mira and Christopher Pickering all proceeds are being donated, ours to maintaining the heritage of the House of Mirelle. 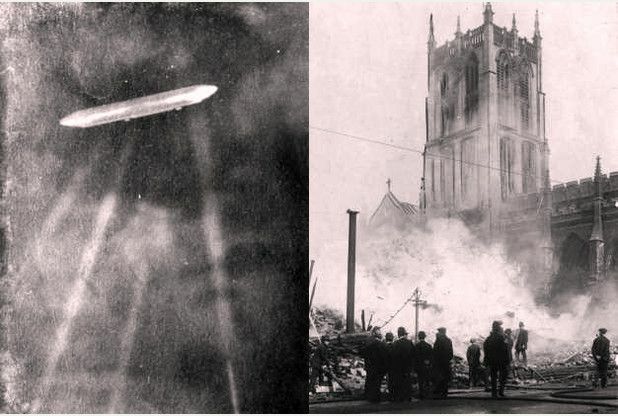 Zeppelins picked out by searchlights in World War 1, the first Hull Blitz. Trinity Minster damaged by enemy action as well as Coltman Street. Source: unknown. Hull’s first Blitz during World War I damaged Coltman Street. In raids on Sunday June 15th it narrowly missed an explosion when bombs dropped from Zeppelins failed to explode on 12th March. In the 1920s it was Coltman Street Children’s Clinic used because of its enormous light windows thanks to Simon Kelsey now restored. Since February 2006 Hull City Council has named Coltman Street a conservation area. It ensures the area’s legacy is maintained for years to come. Friends of Pickering Park, Christopher Pickering’s other legacy are fundraising to Save Our Gates estimated to cost a whopping £148.000. Important to honour, Blogger 150 Facts About Hull calls Christopher Pickering the dark horse of philanthropy in Hull. 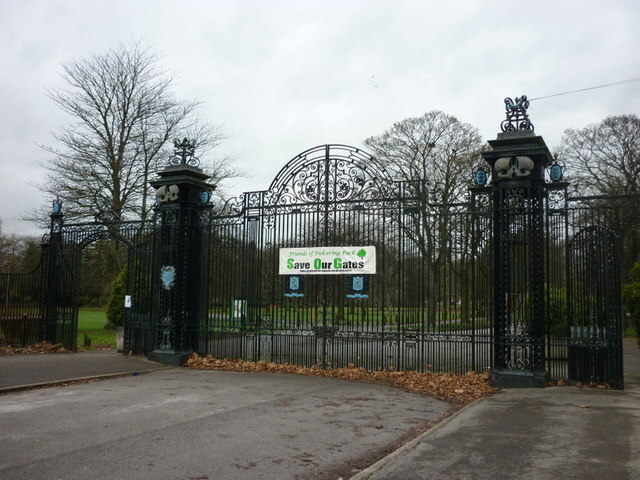 The gates to original owner Christopher Pickering’s park. See https://www.facebook.com/pages/category/Community/Save-Pickering-Park-Gates-222333031151519/. Why we like the story..
We like the story of number 114 because of the history behind its walls. Simon Kelsey’s family and wife Catherine will live there forever. Their generosity, effort and time caring of its legacy, Christopher Pickering would approve. Children Noah and Elijah and the next generation will get to know the roads around Coltman Street like their daddy once did, appreciating how he worked to save its heritage for their family and Hull as a whole. Published 2nd February 2014 by Paul Whittleton. Watch and listen to residents of Hessle Road talking about their memories of the area looking back on its days of glory in 1985.